oh so exciting. cant wait to deck out my 2125 with the portrait version. Yes, I LOVED the pm. Thank you so much. I can't wait! Wow, I sure missed a lot by being away from my computer all day watching football! First off, thank you to echostats. You made some changes which, in all honesty, I tried to make myself. I thought the process seemed fairly simple, but I was wrong. None of my changes had an effect. Odd! I should stick to sleep research. Jamma, I also thought it was odd the way echostats was seeming to take over your project. I am glad, however, that we were mistaken, and that you guys have kissed and made up. That was uncomfortable for a few moments as I read the thread. Let's all hope that this project continues forward. I, for one, am proud of my "Mac" phone. I showed it off today and people thought it was very cool. Oh, and I am really curious as to what was in that PM. Sounds like there are some new things coming in the next update...? Yea, sorry about the thread getting a little odd there. I would like to move on and forget how retarded I was... anyhow, Jamma's a great guy and he's gonna continue to "wow" us. 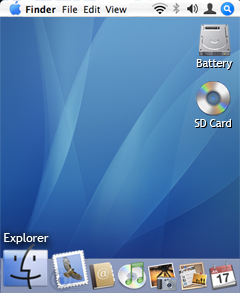 Every q forum I go to, I always laugh when going to the homescreen section and looking at the "OS X" themes. They don't hold a drop of water compared to what he has put together. Sleepdoc, I am glad I helped. I've talked with Jamma and he didn't realize that Verizon was so retarded and for some reason uses "Home Service" everywhere. Lucky him, his only said Orange, which fit perfect in the space he provided. Any how, of course, a homescreen this good can only get better so I can't wait to see what Jamma updates next! At everyone: Suggestions for the new update? --Possibly replace the carrier plugin with finder file etc if people would prefer?? --Possibly change "CorePlayer" to "TCPMP"and change shortcut location as more people are likely to have TCPMP?? Note: I still plan on keeping the same wallpaper...the picture just gives an example of a custom wallpaper. Oh nice, a portrait version! Here's my vote: I would love to see you continue to make this the most OS X theme ever all the way down to the file names. Basically, most people know what their icons are, and if not, they can click them once and then of course they will always knows... so you could use Finder instead of explorer, iPhoto, iTunes, iCal, etc. etc. I have to agree with echostats, I think it would be great to have the OS X file names for the icons. A definite, "yes, please", for the missed calls plug-in. Also, I would like to have events and to-dos show up in the calendar window. "It's getting better all the time..."
I just loaded the skin on my Dash yesterday, but as of yet I really can't think of much that I think need changing. The AM/PM time would be nice just because I am not used to military time. As far as the core player/TCPMP icon, makes no difference to me personally because I have that button running SP Task Manager on my phone. A missed calls plugin would be helpful, but I dont really think necissary. I like the clean look of the skin now, so if you could integrate the missed calls plugin then awesome, but if not you can always tell you have a missed call when the right softkey is "call list" rather than "contacts", as well as from the top bar that shows up in the start menu and most programs. It looks awsome. Anyone wanna give a n00b some step by step instructions on how to properly install this on an i607 ? Jamma has some sweet things in store for us. You all just wait! hey jamma14 i really love the skin and can't wait for future updates. i like the tiger background, when will that be available? For each wallpaper, there are about ten different 213x320 bitmap images to make...which means about 2Mb for each wallpaper if I were to release multiple. So I do not plan on releasing any apart from the default OS X one. If you want a custom background or any custom icons/shortcuts/plugins then you can email or PM me requesting one. Btw to give everyone an idea of progress and what kind of things to expect in the next release please see the to-do list on the first page. I would like to request that the contacts icon be replaced with a safari icon. Most of the time the right softkey is contacts and quick access to PIE would be nice. I have been in talks with Jamma and until I talk to him I cannot say much, but I will say that there are huge plans for this skin. Stick around and check back daily because if everything works out, I am certain this will be the greatest skin so far created. I can't wait to see what you guys come up with! I've been checking this thread whenever I get on the computer to see if there are any new updates, this is without a doubt the greatest skin i've seen for a smartphone or PPC! keep up the good work! thats exactly what i told jamma. its the best skin ever and thats why i have been in talks with him about a partnership. we're going to be updating the theme together from now on... i have a feeling that with both our expertises this skin is going to only get better. we should be coming out with an official announcement here shortly. stay tuned. the changes that i think would be good is that the color scheme should be blue since the background is blue but if u guys are going to have that cool black tiger background the leave the scheme black. a really cool thing is to have the start menu background to be the same as the home screen background but transparent, if that is possible. another cool thing would be for the phone signal to work using the wifi signal next to the blue tooth signal, again if possible. that's all i could think of right now. this is by far the best skin ever mad for smartphones i'm sooooooooo happy u guys did this. i'm fallin in love with mac and it's cool that my phone could look like a mac. right now my pc looks exactly like a mac, well very close. hopefully soon i can get me a mac. great work guys. As I said, as of the current release, it's been all Jamma. So you've gotta give him all the credit. About the changes, all those have been thought about. 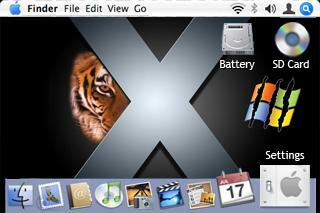 The current goal is the make the theme identical to OS X, the Apple operating system. Yeah the next release is gonna be near perfect! Watch this space people...watch this space. Can I just ask...who reported the file as broken?? I've tested the cab and it works absolutely fine..? If you're having problems could you please ask for help instead of incorrectly labelling the file for other users?? The graphics are done for the next release. I just finished them tonight. I believe the coding is done as well. Jamma and I will be releasing our first co-release this week. Stay tuned for the first Skin Project release. Believe me, it will blow you away. If you are a mac user, I can assure you... you will not be able to tell the difference between this up and coming homescreen and your OS X desktop. I'm a picky guy and this thing is graphically exact. It's only getting better, check back daily. OMG u guys need to stop this teasing and bring it out i'm curious to see what this will look like can't wait.